The golden lion lets out an eternal roar, its ruby eyes glinting. It holds a stunning amethyst in its mouth, and watches over the two golden eagles circling below it, who grasp gold sceptres and a long line of pearls in their talons. Together, they complete the hilt of a 4-foot long sword. It took him a year to finish, but Bob didn’t request any money for the job, only that the man who commissioned the sword pay for all the materials. Bob has always been good with his hands. Born at home in a small town in Ontario in 1939, he began wood carving at a very young age. Bob didn’t stay in taxidermy for long, explaining that it was a very messy job, although he still admires some people’s ability to make animals appear as if they were alive. When he was 17, Bob’s father died. Now the breadwinner of the family, Bob moved north to Elliot Lake, a boomtown famous for its uranium mines. At the time, it was illegal for anyone under 18 to work in the mines, but Bob had no alternative but to lie his way in. 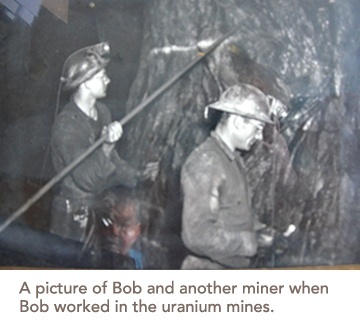 Bob said they didn’t have to wear protective gear, because it was a very low grade of uranium. However, today Elliot Lake is well known for its radioactive sites and the effects radioactive waste has had on the environment. Back in 1957, when Bob worked in the mines, Elliot Lake was a haven for most anyone who couldn’t get a job anywhere else. Bob worked long hours in the mines, but he also had a lot of leisure time. He spent it perfecting his wood carving and writing prose. When he left Elliot Lake in 1968 he started school at the Ryerson Polytechnical Institute, today known as Ryerson University. He graduated from Ryerson in 1970 as a mechanical engineering technologist. He began working at Pilkington Glass as a superintendent. Pilkington is one of the leading producers of sheet or float glass, which is produced by floating molten glass over a layer of molten metal. This technique makes the glass incredibly smooth. It was around this time that he was married and had a son and daughter. After Pilkington he worked at Rothman Cigarettes, but said he “got away from that pretty quickly”. Instead, he began working at Meccon Industries, which is where he was working when he crafted the lion-head sword. He also crafted two rings for his daughter, and worked on several decorative knives, which have beautiful nature scenery cut out of the blade. About 10 years ago, Bob retired from Meccon Industries when he was diagnosed with a brain tumor. They operated, and the surgery was a success. 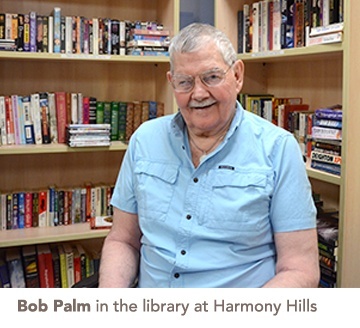 Today, Bob continues to do his wood carving and write poems and prose at Harmony Hills Care Community in Scarborough, where he lives. 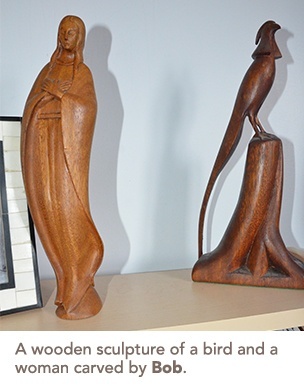 His room is decorated with some of his favourite carvings, and he has a stash of works-in-progress behind his door.